#209–Northern Bridge Tour second time around . . . Considering we’ve had over 50 inches of rain since Christmas and we can remember each of the very few days without rain since then, we were really lucky on the first two bridge tours. 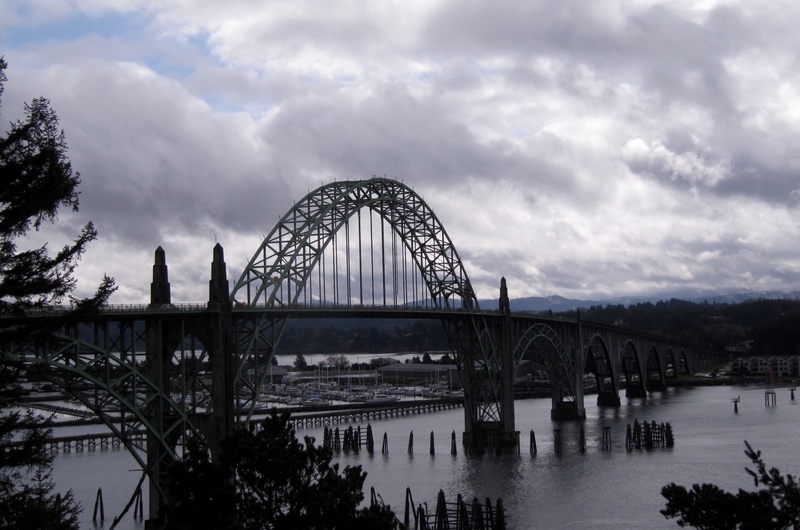 We had a brief shower off the bus at the Yaquina Bay Bridge first tour and stayed on the bus due to heavy rain at the Siuslaw River Bridge on the second tour. Otherwise, those tours were rain free. With the forecast for steady rain and 20 mph winds on this tour, I prepared accordingly––rain pants, rain hat, waterproof shoes, the works. It was drizzling as everyone boarded and since this group was there early, we left early. I passed out the itinerary and glossary. And I let everyone know that I would be doing the talking on the bus so when they got off at each bridge stop, they could wander around and look and not have to stick to me. This would be a tour of 10 bridges with nine stops. I let them know that we would try to park the bus at each stop with a good view of the bridge and no one had to get off—especially if it was raining. I knew four people on this group and four other folks were from Corvalis. They had come over the evening before. And one person could not make it because he awoke with a cold. So there were 13 plus Benny, the same driver as last week, and me. It was a most upbeat group. A great group to spend a day with. On this tour as with the others, I covered McCullough and cathodic protection first because both apply to all the historic bridges. 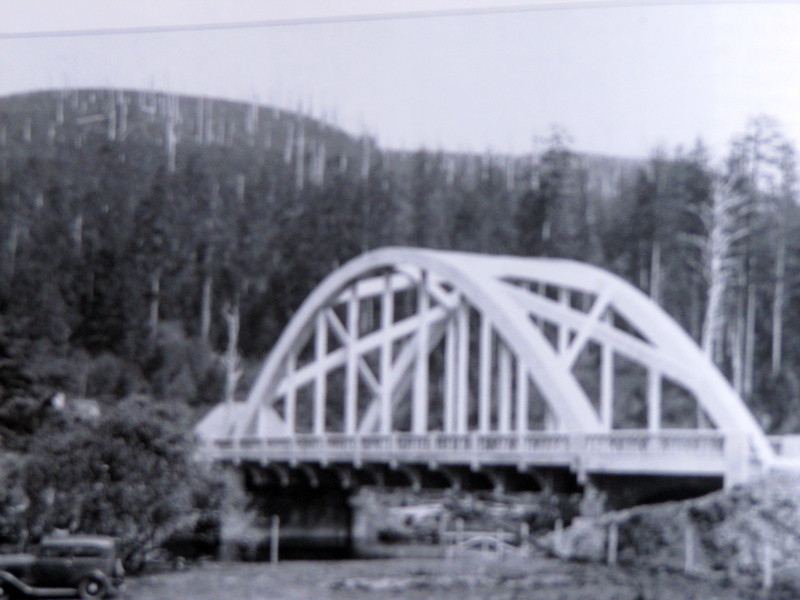 Then I talked about the tied arch design that made McCullough famous, since the first two bridges are good examples––Big Creek and Ten Mile Creek. We stopped after passing through one of them to look back to see if we could see what was different in the photo of the original bridges and today’s look. Notice the X-shaped cross bracing on the end of the bridge. The difference is in the upper cross bracing. About 15 to 20 years ago, the two legs of the Xs on either end were cut off and a straight across brace added. This allowed large motor homes and chip trucks to use the road legally––otherwise they had to go down the middle to avoid hitting the bridge. Notice the straight bar cross bracing on both ends of the bridge. Next, we turned into Neptune State Park to see Cummins Creek Bridge. Normally with no wind, reflections are possible, but not this time. With all the rain, Cummins Creek was raging. There are always a few folks who did not know this bridge was here. 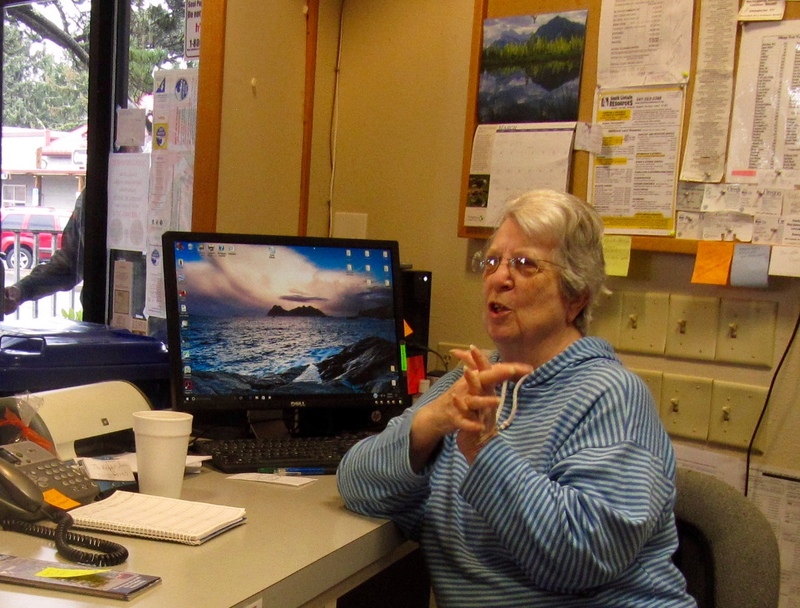 Our next stop was spending a half hour at the Historic Alsea Bay Bridge Interpretive Center with Mary Davis, who has been there for many years––and is now retiring. She took the time to explain everything one last time. This is like a museum to the coastal bridges and even has a replica of McCullough’s office with his stuff in it. There’s a model of the old Alsea Bay Bridge and a video of the construction of the new bridge. Unfortunately, the video player was not cooperating, and we didn’t get to see the video. There is also a great timeline of transportation covering the Oregon coast. 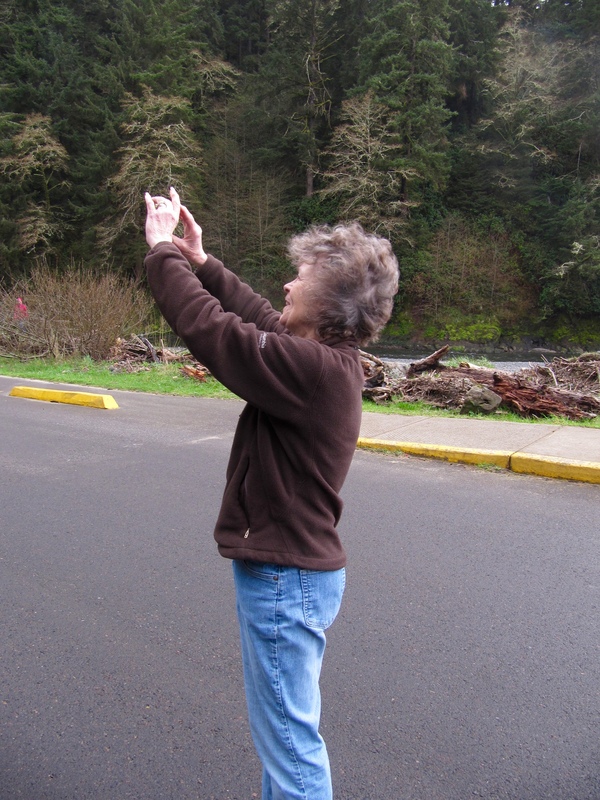 Mary Davis at the Historic Alsea Bay Bridge Interpretive Center. We learned all about the interpretive center. Then we stopped at the most photographed bridge in the Northwest—the Yaquina Bay Bridge in Newport. Still no rain so far! We drove under the northern end and got off. We saw two of the elegant stairways, looked under the arches, and walked over to where we could get a decent shot of the whole bridge. There were even a few blue-sky breaks. The Yaquina Bay Bridge at Newport. Under the northern end of the Yaquina Bay Bridge where we could look through the arches. 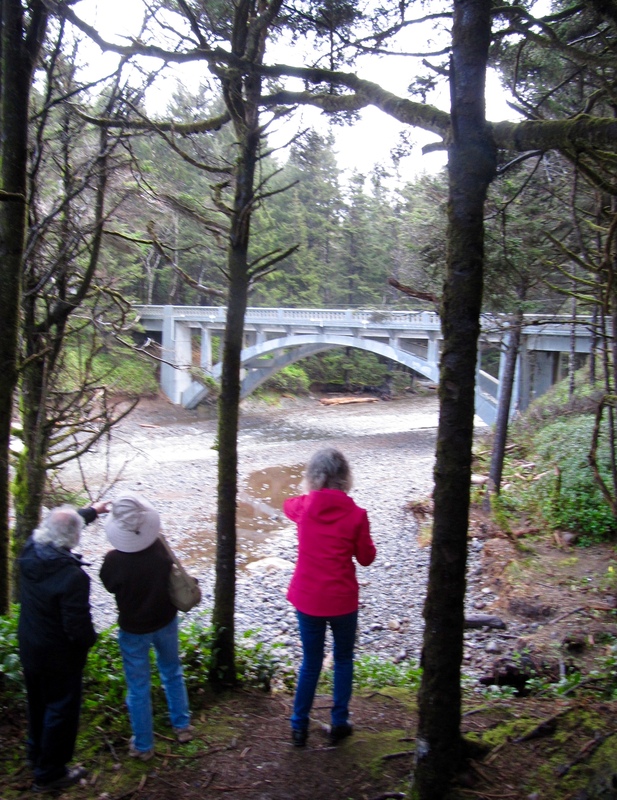 North of Newport, we turned into Beverly Beach State Park to see Spencer Creek Bridge, one of the replacement bridges designed with a sense of elegance. It’s built to last 120 years and to withstand a major tsunami. Everyone was impressed with its massive arch and attention to detail in the decorative portions. It’s really close to the waves, and we were all amazed at the numerous logs that have washed up under the bridge from the ocean this winter. And the waves were still in battering mode on this trip. 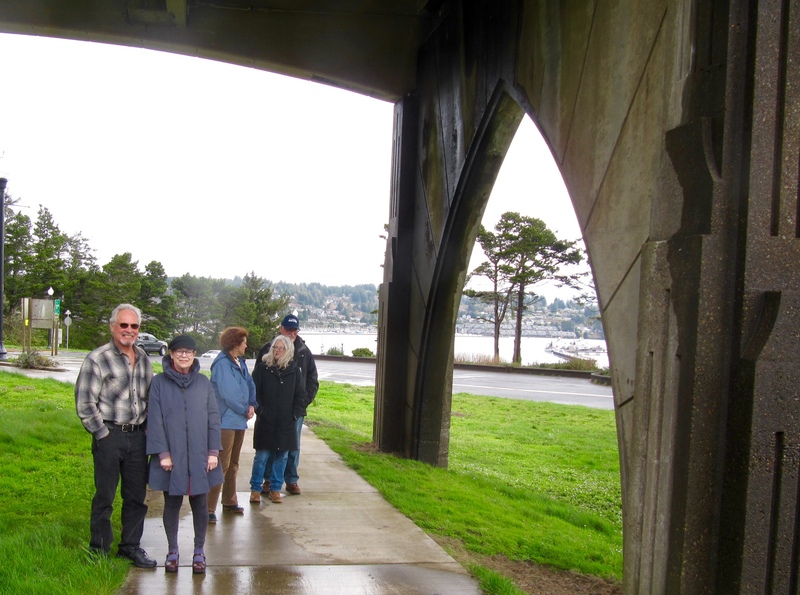 The massive arch of the Spencer Creek Bridge dwarfs members of our group. 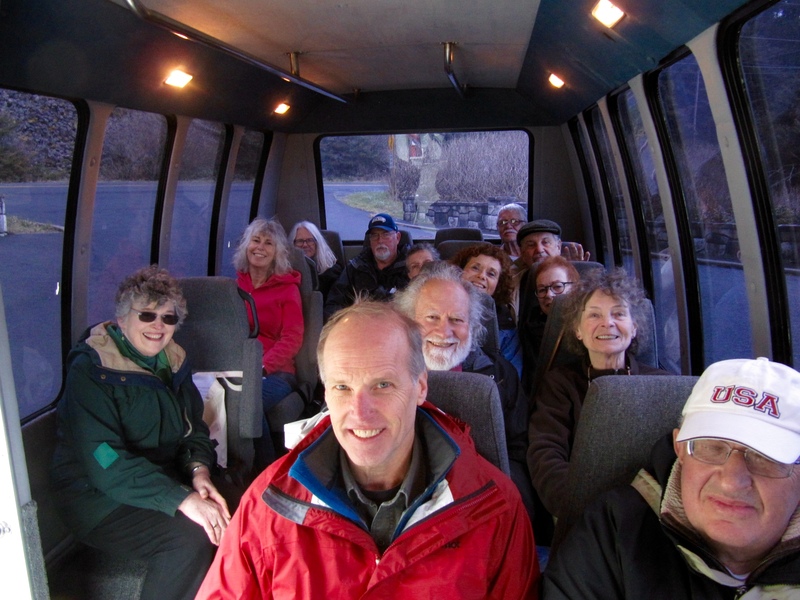 The next stop got the biggest cheers––Tidal Raves in Depoe Bay. Because this restaurant consistently has wonderful food and good service along with its fabulous view right on the bay, no one left disappointed. Two large tables were set up for our group. At the table I sat at, folks enjoyed wine or beer with their meals and nearly all of us had dessert. A very enjoyable lunch to be sure! From this point on, we headed back towards Florence. 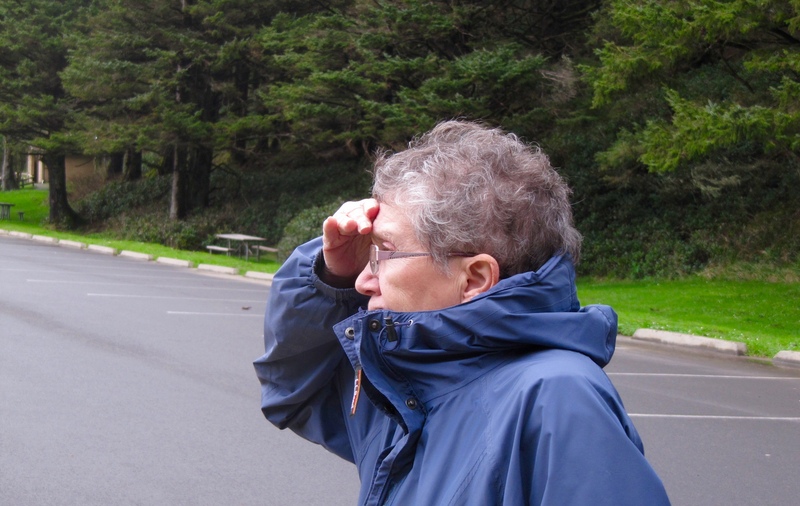 But before leaving Depoe Bay, we turned at the signal and parked off the highway at public parking. We walked down to and under the Depoe Bay Bridge. 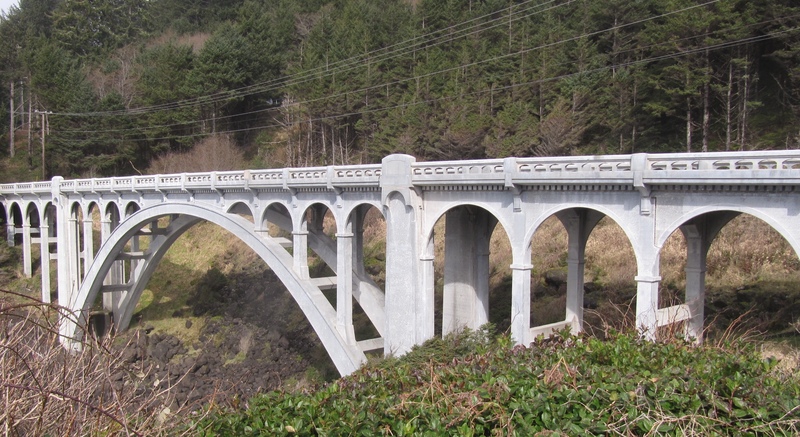 Actually, we were going to look at the two Depoe Bay Bridges side by side—one designed by McCullough in 1927 and one built in 1940 after a fishing village had developed. The two bridges are very similar, but not the same. It’s not hard to tell which one McCullough designed. Most people don’t realize that there are actually two bridges, and there are always a few who won’t believe it until they see it. And still no rain! I tempted fate by removing my rain pants after lunch. 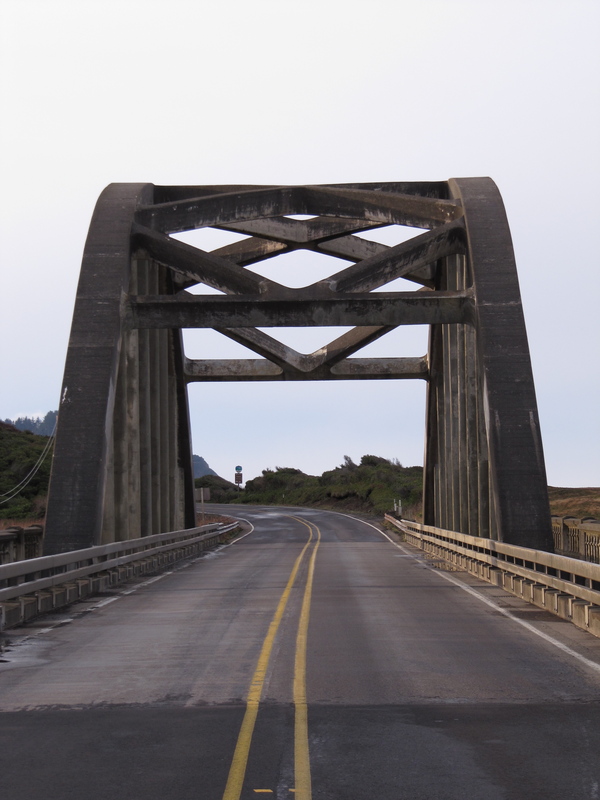 The Rocky Creek Bridge was once on Hwy 101, but the highway was moved several years ago up on the slopes of Cape Foulweather when the highway started dropping off into the ocean. It was only a short distance to Otter Crest Loop where we saw the beautiful and symmetrical Rocky Creek Bridge (aka Ben Jones Bridge). Again, folks oohed and ahhed because most people don’t realize this bridge is even here. 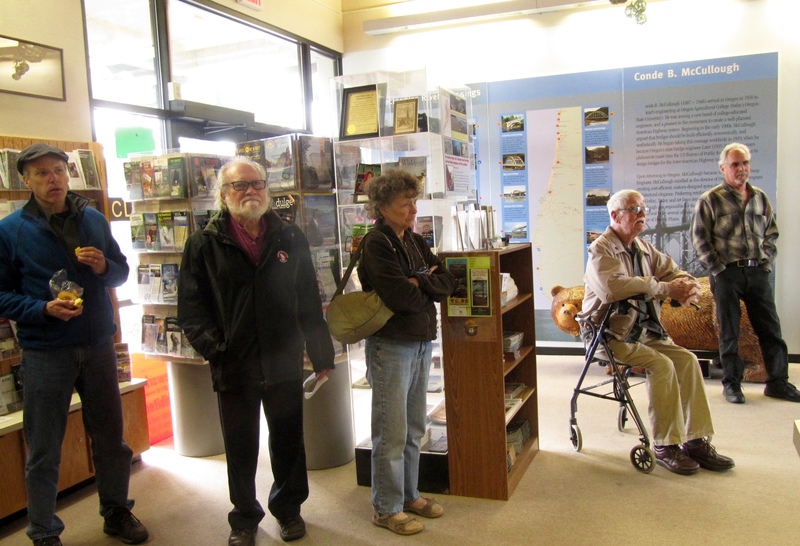 There are also interpretive displays about McCullough, cathodic protection, and Ben Jones, the Father of the Oregon Coast Highway. He was the one that introduced a bill in the state legislature in 1919 to build a coast highway. I passed out a chart of all the McCullough bridges on the coast and a self-guided tour of the coast bridges complete with map. So as a group we were discussing these. And I was so engrossed in answering questions and giving the pop quiz that I forgot to tell Benny to stop at the wayside at the northern end of the Alsea Bay Bridge. We were on the bridge before I realized it. Since we were behind schedule, I didn’t have him turn around and go back. Between Waldport and Yachats we ran into a terrific squall with heavy rain. Fortunately, it didn’t last. 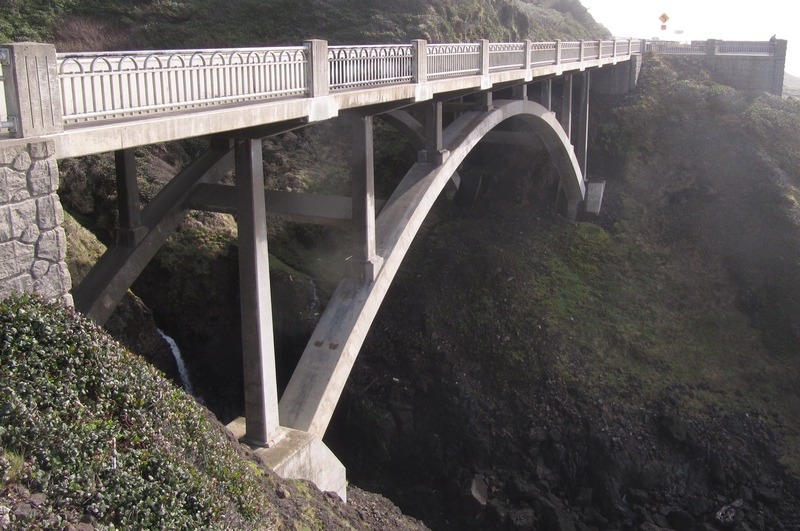 Cook’s Chasm replacement bridge at Cape Perpetua. Next stop was Cook’s Chasm, another one of the replacement bridges built with a sense of elegance. We got off the bus to take a look. This is also where you can see the spouting horn at high tide. Since it wasn’t high tide, no spouting horn for us. 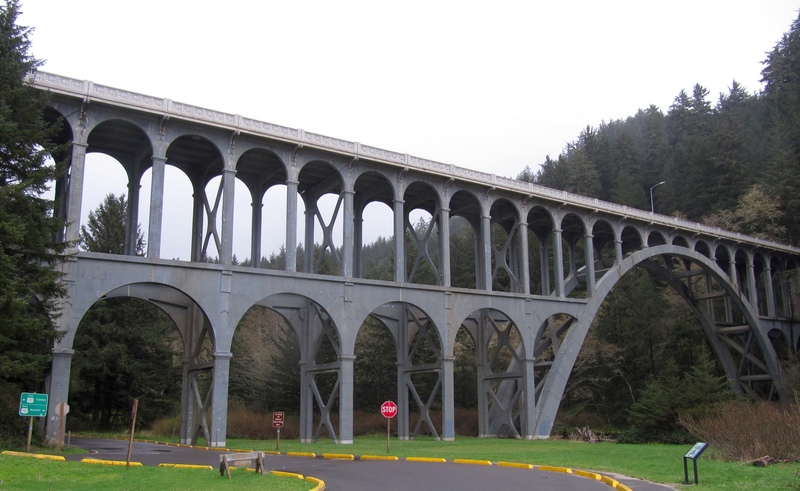 Cape Creek Bridge at Heceta Head State Scenic Viewpoint. A familiar sight throughout the day. Every stop was a photo op. Then we headed to Florence and LCC. None of us could believe that we weren’t rained on even once and no wind! 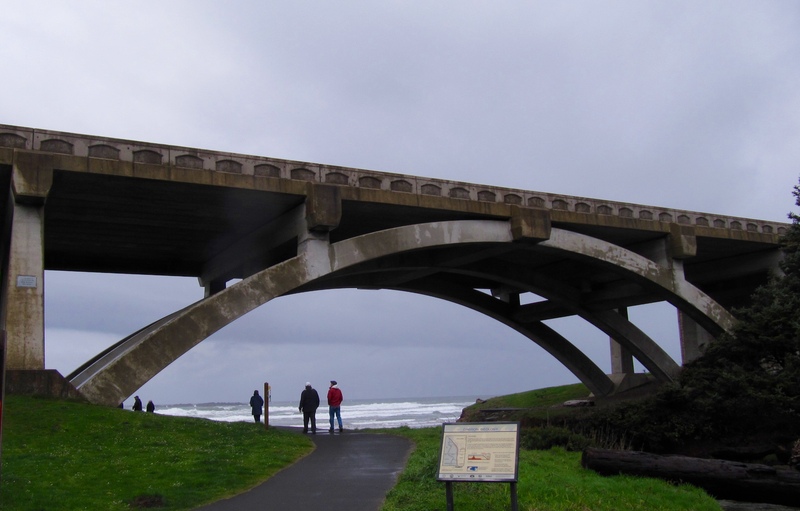 It turned out to be a great day, after all, for checking out Oregon’s incomparable coastal bridges. This entry was posted in Adventures with travel, Crossings: McCullough's Coastal Bridges, Judy's Book Adventures, The Crossings Guide to Oregon's Coastal Spans, Uncategorized and tagged Alsea Bay Bridge, Big Creek Bridge, Bridge Tour to Historic Coastal Bridges, Cape Creek Bridge, Cook's Chasm Bridge, cummins creek bridge, Depoe Bay, Depoe Bay Bridge, Florence, Lane Community College, Newport, Outward Ventures, Rocky Creek Bridge, Spencer Creek Bridge, Ten Mile Creek Bridge, Waldport, yaquina bay bridge. Bookmark the permalink.